Oran Kearney says his Coleraine side have the belief to go on and win the Danske Bank Premeirship. The Bannsiders have hauled in leaders Crusaders at the summit, with their one-time five point advantage now reduced to only goal difference. However, just as he has done all season Kearney will not allow his side to get ahead of themselves, but he feels they are more than capable of winning their final three league games and further ramping the pressure up on the Crues. “We have never not thought we could win the league,” he said. “There is no point saying you can’t, we are not a big headed team, we never get ahead of ourselves, but in the same stretch, the one thing our changing room doesn’t lack is belief. “They have grown as a group and a unit over the last 18 months and cup finals, semi-finals and Europe have added to that. “With every big cup final we play, they grow and grow, there is no doubt in our belief that we can go and win our next three games. “That’s all we can do. “A month ago it was five points and every football expert in this country had us written off like they’ve done all season. “We will die at Halloween, we will die at Christmas and Crusaders have the knowhow. 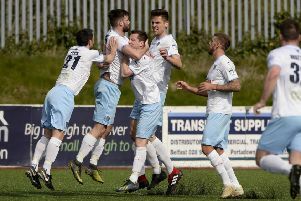 The Showgrounds was bouncing after Jamie McGonigle’s late winning penalty against Cliftonville last Saturday, and Kearney is expecting the same when old foes Ballymena United visit this weekend. “Everybody felt the buzz after the game,” said Kearney. “Absolutely the fans played their part. “It can be an eerie place, particularly at times like this because it is tense, it is edgy and we all feel it. “We felt it at Seaview and a lot has been said about Crusaders having four home games, but sometimes that edginess can creep in. “I felt it here before, but the noise and singing after the goal went in lighted the place up and it was a different environment. “We have a massive derby next weekend and it’s not about bragging rights or anything like that, it’s about another three points to try and turn the screw. “They will want to come here and put a dent in our title challenge but our agenda is far higher than theirs. Coleraine may feel that their derby rivals would nothing more than be the party poopers, but that’s not the case according to Sky Blues boss David Jeffrey. He said his side will be fully focused on their own agenda on the day. “There will be those who look at our game against Coleraine and suggest we will be going there to put a spanner in the works for them,” he said. “Anyone who thinks that is the motivation for Bryan McLoughlin and I has another think coming! “We are going there with one thing on our mind - we are trying to get as many players fit and available so that when it comes to play off time we are in good nick. “We are delighted with what Coleraine are doing. What ever Coleraine are doing, Coleraine are doing. United put a major dent in Crusaders’ title bid last season when they ran out 3-0 winners at Warden Street in the penultimate game of the season. But again Jeffrey pointed out they were only focused on themselves that day too.